It’s a question we should ask ourselves more often. Why? Because the truth behind what really drives us can be a powerful revelation. We dedicate a vast amount of time and energy into the work we do; on average, we’ll each spend 80,000 hours at work in our lifetime. And, if we’re honest, is that because we want to, or because we need to? It’s true we can’t all go in search of a job which feeds the soul. For some, other factors take priority; in many cases, “because it pays the bills” is reason enough. But there are individuals we can look to, as examples of seeking workplace purpose in practice. It’s not always pretty, it’s not always glamorous; it can it lead to failures. 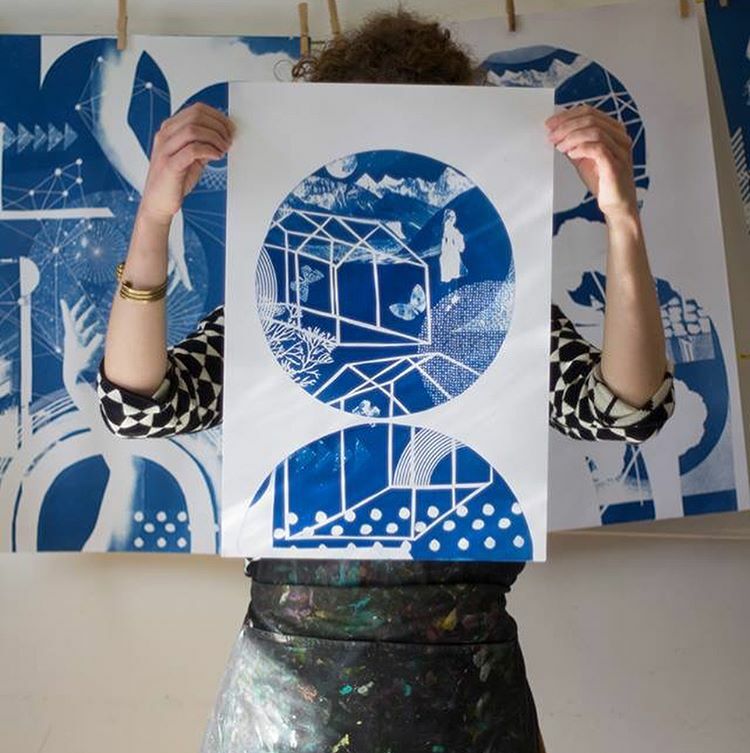 From a listed building, in the north side of Norwich city centre, Jo Stafford devotes her time to running and growing Print To The People; an artist led social enterprise, dedicated to the production and promotion of traditional printmaking processes. Just stepping into PTTP’s premises, and you can feel the buzz of creativity; prints, collages and doodles fill the walls. There are tongue-in-cheek notes left between volunteers, exchanging useful info from one shift to the next. I’ve always thought you can judge a workplace by its mug collection, and the quirky assortment on display here is no exception; every one seems to have a story to tell. And that’s the really wonderful thing about what Jo’s built with Print To The People. She’s created a space where anyone and everyone is welcome; if you feel you’ve something to contribute, then you can. PTTP’s open access studio space enables us all to explore our creativity. Whether you choose to book onto one of their many expert-led workshops or courses — teaching skills such as letterpress, etching, fabric printing and hand-drawn typography — or want to volunteer your time, in exchange for use of the studio facilities, the PTTP family is a welcoming one. And “family” is the right word; no one (even Jo) is on a payroll. The day to day studio management and all its associated admin — of which there’s a great deal! — is all done by volunteers. They are there for the love of print, and of Print To The People. This business model clearly works; 2019 is a momentous year for Jo and the rest of the team, as PTTP turns 10 years old. But it hasn’t all been smooth sailing; even today the independent enterprise faces giant obstacles to overcome, including the potential demolition of their headquarters at The Old Box Factory. This threat has been looming for months, and PTTP still wait to hear if the council will go ahead with planned redevelopment work of the surrounding area. In your words, Jo: what is PTTP all about? I guess if you were thinking in a tangible sense it is about Printmaking and all that it encompasses, so the physical equipment and the space needed for processes such as screen printing, etching, letterpress, linocut, and woodcut. However to us it is so much more than that. It is the community and family that has grown around what we do; people sharing skills and ideas, right the way from beginners to experienced practitioners. And why is that work meaningful to you? I think being grounded in our community and locality really helps bring meaning to what we do, as we can see direct results. For example, the look when somebody sees their print being revealed for the first time or seeing somebody launch a new range of designs and grow their business. There is also something about working with your hands and touching every print that is very human. And being part of keeping these processes alive and using equipment that is 100+ years old which makes what we do very rewarding. PTTP is clearly very close to your heart, but what do you think other people take from the work you do? I hope everybody who comes to the studio — whether it is just to visit or on a course or making their own work — is infected by how passionate we all our about printmaking and will continue to keep the processes alive by passing on their knowledge and skills. How did you get to where you are now? What inspires you? As creative types we get inspiration from a lot of places and it is always interesting visiting other studios and creative enterprises to see how they do things. So, there’s really too many to mention! But I guess — to get a bit cheesy! — one of the things that is great about sharing skills is seeing what other people do with them, so the people who use our studios and come on our courses always inspire us to keep going! Can you tell me about any “a-ha” moments you’ve had, for better or for worse? That is a difficult one as I feel we have taken the organic route; developing what we do slowly but steadily. But of course our 10th birthday this year feels like a great milestone; which we celebrated with a very unique — and slightly saucy — special edition calendar! It also felt great when we moved into our own building, rather than the smaller rental place we had before; and being able to grow our team, working with people’s strengths. When your work is also your passion, how do you approach maintaining a healthy work life balance? It is really, really, really difficult! Especially these days with smartphones where everybody is online and connected 24/7 it is hard to step away from things as you can literally carry your business around in your pocket. I try really hard to turn my phone off when I get home and not answer emails at the weekend. A book that helped I would recommend was ‘Manage Your Day-to-Day: Build Your Routine, Find Your Focus, and Sharpen Your Creative Mind’ by 99U; it’s all about routines and being strict with yourself basically! I would also say that although saying “yes” to things is great, we have maybe learned that sometimes saying “no” can also be a good thing… although it’s harder to do! If you could paint a vision of the future, where would your PTTP be in five years time? Hopefully in a bigger building as we are running out of space where we are! It would also great to be in a building where we had more security of tenancy — our current building will get knocked down if the Anglia Square Developments get the go-ahead! To know Print To The People is to love them. And if you find yourself in Norwich or Norfolk, book yourself in for a printing workshop or short course. And, if you aren’t in the East of England, you can also show your support via their Etsy store. As a non profit, earnings are reinvested in the studio and the great work they are doing. Oh, and there’s a studio dog, named Squeegee. Do you really any to hear any more?